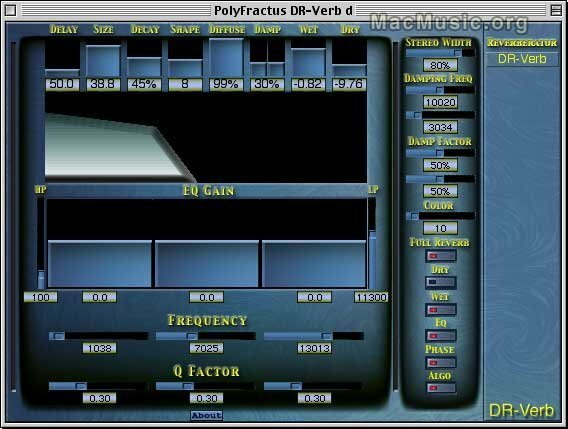 PolyFractus just released DR-Verb 1.3b, a high quality Reverb VST plug-in which emulates any room from small rooms to a "Hall" or "Church." This version adds a new reverb algorhithm and only supports Mac OS X. Thanks to its large number of controls and to its EQ section, this reverb can also be used to produce strange ambiences or even FX sounds. DR-Verb is a US$40 shareware. The 1.3b update is free for registered users. - Any Macintosh software using Steinberg VST technology. Download DR-Verb from MacMusic.org Post a comment ? We've waited a long time for this: Cycling `74 announced at AES that Pluggo 3.1, a new version of its wildly popular audio plugin software, will support Mac OS X and Audio Units and should ship in mid-November. Pluggo has been a Mac favorite for a long time: it's Mac-only, it includes a completely unique collection of over 100(!) plugins from the bizarre to the indispensible, and as if 100+ plugins weren't enough, you can design your own audio plugins in Cycling `74's Max/MSP visual development environment. Write a plug-in once, and it'll work in RTAS, VST, and AU environments on OS X. The release of Pluggo for OS X will mean hundreds of new plug-ins will soon be appearing on OS X. It's a critical piece in the transition to OS X, and for many, many users, it will mean OS X audio has finally arrived. Steinberg had a bevy of announcements regarding its Nuendo production system in New York last weekend. Nuendo 2.1 will be available this month at dealers worldwide, featuring new collaboration tools for multiple users to work via TCP/IP. ID (for Input Device) is a new control surface for Nuendo that's intended to feature a traditional "console" design. Lastly, Nuendo will now support the DTS encoder for digitally encoded surround sound in that format. 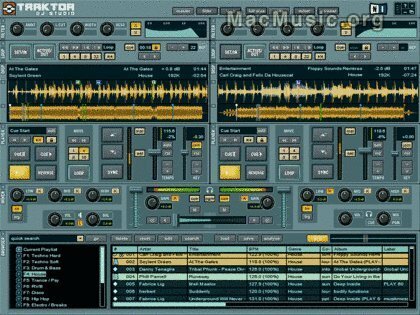 Traktor DJ Studio 2.5 features a redesigned time stretching engine allowing pitch-independent tempo changes of up to +/- 30%, or tempo-independent pitch shifting of up to six semitones, without audible artifacts. Also in the upgrade: an enhanced visual interface with a full-length track overview for each deck, OSC integration for sync across networks, 100% Final Scratch compatibility, seamless looping, user-defined screen setups, complete support for iTunes song fields, hot swap of external devices, and volume/tempo recognition on import. EUR/US$199, EUR/US$49 upgrade (download) or EUR/US$69 (boxed). Available immediately. 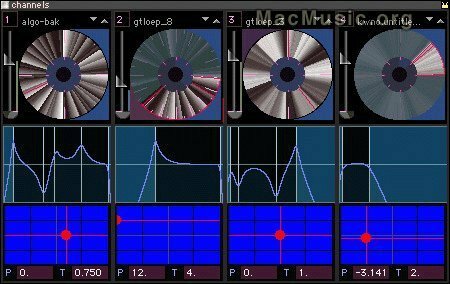 Radial is a fascinating Mac-only loop-based composition and performance tool, but its release earlier this year was largely overlooked since it lacked OS X support. That should change soon: Cycling `74 has announced Radial 1.1 with full Mac OS X support plus new file grouping and improved sync capabilities. Radial is "not simply another loop sequencer" says Cycling `74, but a performance tool uniquely optimized for live performance. Extras include a dozen Pluggo effects, a free library of loops, and now new plug-ins for live audio input, parameter automation, and reverb. Stay tuned for a review soon to see how Radial stacks up to Ableton Live for live performance. US$199 MSRP, expected to be available early November. Cycling `74 Post a comment ?